U-boats sink three UK-bound neutral merchant ships. Food rationing introduced in Germany on small scale. Warsaw, Poland surrenders to Germany; Polish government-in-exile established in Paris. 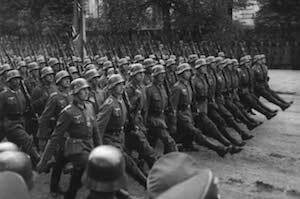 German Special Task Force troops execute 800 Polish intellectuals and leaders in Bydgoszcz. 18th successive night raid on London. Southampton and Brighton also attacked. Plans to evacuate mothers as well as children from Blitz areas announced; 444,000 children already evacuated from London area. Petrol goes up to 2s U 2d per gallon. The convoy of 150 tanks dispatched by Churchill on the 22nd August, arrives at Port Said in Egypt. Tobacco ration in Paris reduced to four cigarettes per day for men and zero for women. Army Group South begins an offensive against the vital land bridge to the Crimea at Perekop. Units of Army Group A launch an attack against the Black Sea port of Tuapse. The German Chief of Staff, General Halder is sacked by Hitler and is replaced by General Zeitzler. The British Second Army reaches the Lower Rhine in force. The British paratroops at Arnhem are now under severe pressure. British troops cross the German border to the Southeast of Nijmegen. The U.S.
Third Army’s Moselle bridgeheads to the South of Metz are sealed off by the Germans. The British XIII Corps captures Marradi in Italy. The Russian offensive in Baltic States ceases.